It is perhaps not surprising that Barcelona's Yaya Toure believes he plays with the two best footballers on earth. After all, the likes of Lionel Messi, Samuel Eto'o and Thierry Henry have scored an incredible 97 goals between them this season. But Toure is not talking about Barca's 'Holy Trinity'. He is instead referring to the two men he watches weave their destructive patterns from midfield. According to Toure, they do not come any better than Xavi and Andres Iniesta - and he tells me twice, just in case I might have misheard him, or worse, not believed him. Can Barcelona beat Man Utd by playing their brand of beautiful football? "They are the two greatest in the world for me, I cannot speak highly enough of just how good they are," the 26-year-old said. "They are different players, but equally important to this Barcelona team - don't ask me to choose between them because I couldn't. "The most important thing at Barca is the kind of football we play, beautiful football, and when Xavi and Iniesta are on the ball everyone's having a good time - both on the pitch and in the stands." In a nutshell, that is what FC Barcelona is geared towards, and why in Xavi and Iniesta they have two players who carry the philosophy of the football club onto the pitch. It is a philosophy that was born when Dutch great Johan Cruyff arrived in Catalonia in the 1970s, became a fixture when Cruyff returned as manager in the 1980s and now, thanks to Cruyff's continued involvement in the club, is deeply entrenched. Football, Barca believe, should be dedicated to free-flowing attacking play - the kind of 'Total Football' that Cruyff and his Dutch colleagues produced in the 1970s to worldwide acclaim. Xavi and Iniesta have been at Barca since they were 11 and 12 respectively and that message has been drummed into them since the day they arrived. It is a message based around ball retention, about superior technique, about lightning-quick passing and the ability to utilise wide open spaces on the pitch. "Receive, pass, offer, receive, pass, offer," is how Iniesta recalls his education. Xavi, meanwhile, talks as if his talent is a side issue: "I am a child of the system, a pupil at the Barcelona school of football." It is a system that has helped produce what many La Liga experts are calling the greatest Spanish team since the Real Madrid of the 1950s, and it is not by chance that this has come about. Toure, the younger brother of Arsenal defender Kolo, says the focus in training at Barcelona - from the youth teams at La Masia, the club's academy, through to the first team squad - is different to that of any other club. "Playing great football is a part of this culture, it is what we are here to do," said the former Olympiakos and Monaco star. "It's just different at Barca. The kids are taught from such a young age about how the ball should move, how to protect the ball at all times, how to never give it away. What he says: "Milan offered me a lot of money in 1999. But I wanted to succeed here. I never want to leave"
"At Barcelona the physical aspect has never been the most important thing, the emphasis is always on technique - that's why every footballer wants to play for this team. "It isn't new, either, it's something that has been happening over a long period of time here. That's why people go to the Camp Nou, why people take their children, their wives - because it's enjoyment for everyone. "It's football for the people, and it means so much more when you win playing beautiful football." Barca's dedication to the system, especially through the constant midfield probing of the metronomic Xavi and the indefatigable Iniesta, has paid off magnificently in this remarkable season. Led by Messi (37 goals), Eto'o (34) and Thierry Henry (26), Barca have scored a record-breaking 156 goals and they have done so with a flair and panache that has had the purists purring. They have succeeded by attempting to pass teams into submission without ever even contemplating falling back on a Plan B - take the Champions League semi-finals, for instance. Over two legs against Chelsea, Barcelona attempted a mind-blowing 1,359 passes, with 82.1% of them finding their intended target. Their opponents, in the same 180 minutes, attempted 687 passes, with a success rate of 59.5%. What he says: "I want to stay. When I say I want to retire at Barca, I say it with all my heart"
Xavi himself attempted 226 passes in the two games - roughly one-third of Chelsea's team total - and completed 73.8% as he constantly sought to outwit the English team's seemingly impenetrable defence. Despite their frustration at going the best part of 180 minutes without scoring, they remained steadfast in their belief that if they kept playing their way, the breakthrough would come. Arguably they got lucky against Chelsea - and Barca might find it even harder against a Manchester United side who are equally capable at the back but possess a far greater attacking threat - but Pep Guardiola's team will carry on regardless. In the Champions League this season, Barca's pass completion is 87.2%, way in front of any of their rivals - Manchester United are fifth, with 82.6%. In in their semi against Arsenal, United attempted 1,102 passes, completing 70.4% but it is a safe bet that Sir Alex Ferguson will not be expecting his team to dominate possession in the Stadio Olimpico, then. Giovanni van Bronckhorst, who played for Barca between 2003-07 and won the Champions League in 2006, believes Xavi and Iniesta have almost benefited from a kind of telepathy on the pitch. "They have a special relationship, they always have, they just seem to know where the other one is," Van Bronckhorst told BBC Sport. "They are two players who have absolutely everything - technique, the ability to score goals, play the killer pass, they are just complete midfielders. "Watch them and look at how they never lose the ball. They aren't big, but they use their bodies to lose a player, they are so smart in the way they protect that ball like it means everything. "I think the Barca model is set up to produce players like these two. We used to watch the youth teams training, and there are some unbelievably gifted players down there." If Xavi and Iniesta have blossomed even more this season, coach Guardiola, in his first season in charge, must take his share of the credit. For Guardiola is from the same stock. He arrived at Barca when he was 11, became captain of Cruyff's 'Dream Team' side that won four successive La Liga titles from 1991 to 1994 and secured the club's first European Cup in 1992. Before he left Barca as a player in 2001, he had already spotted the duo's potential. During Iniesta's first training session with the first-team, he pulled Xavi to one side and told him: "You're going to retire me - but this kid's going to retire us all." 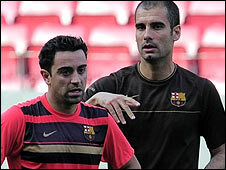 It is Guardiola's ultimate faith in Xavi and Iniesta's ability that has given the manager the freedom he needed to commit his team unequivocally to the methods he learned under Cruyff. "They are the heart of this team - this team that is on the verge of winning absolutely everything," added Van Bronckhorst. "Their importance to Barcelona must not be underestimated because they are the ones who start all the moves and then play any pass required by the three up front. "If you see how this team plays, you know that is how football is meant to be." Ferguson is an unabashed admirer too. After Barca's staggering 6-2 win at arch-rivals Real Madrid last month, he called it an "absolutely magnificent performance, a battering". He is also aware of the threat Barca's deadly duo pose to his side's chances of winning club football's showpiece competition for a fourth time. "I don't think Xavi and Iniesta have ever given the ball away in their lives," said the Scot. "They get you on that carousel and they can leave you dizzy." Ferguson will hope his head is not spinning after yet another masterclass of the beautiful game from Barcelona's midfield maestros. Whisper it quietly, but Toure even believes his team-mates might one day be mentioned in the same breath as some of the greats of the game. "Xavi is special, it is an amazing thing for us to be able to rely on a player like him, who was named the best player at Euro 2008," he said. "As for Iniesta - he is the Zinedine Zidane of the team, because he can do whatever you want him to with the ball. "They are just two great footballers playing great football." Who has won the European Cup?